What is there left to curb you now? As in many other baseball-crazy communities at the turn of the 20th century, the game in the central Ohio community of Springfield was dominated by sons of Ireland. Players named Dunn, Shay, Malarkey, Minahan, Mitchell, Harley, and Donahue, all sons of the Emerald Isle, went forth from the city’s ballfields to play professional baseball. The family that dominated the game locally was the Donahues: brothers John, Pat, Frank, and George. The first of them to make his mark on the professional baseball scene was John, better known as Jiggs. John Augustus Donahue was born on July 13, 1879, the first son of John and Mary Donahue, who were parents of six other children. (In addition, Thomas Moore, a son from Mary’s first marriage, in Kentucky, grew up in the Donahue household.) John Augustus’s father, John, was a blacksmith and like Mary was born in Ireland. John died in the 1890s, meaning Mary was twice widowed with a large Irish Catholic family to raise. The eight siblings, seven boys and one girl (the youngest), were all expected to help out by working. Thomas Moore, the oldest, was a blacksmith, Martin a bartender, Edward a toolmaker, George, 19, an iron molder, and Patrick a clerk. Francis and Mary (named after her mother) did odd jobs. Donahue’s practice and skill paid off. In 1897, at the age of just 17, he was signed to catch for Marietta of the Ohio-West Virginia League. (Marietta also employed another Springfield Irish cigar-store veteran, Fred Shires.) Later in the season, Jiggs signed on and finished the season with Wheeling of the Interstate League. At Wheeling he played with another Springfield native and future big leaguer, Danny Shay. In 1898 Donahue signed with Grand Rapids (Michigan) in the Interstate League but played just two games before returning to Ohio with the Dayton Old Soldiers of the same circuit. For Dayton he played in 91 games, most of them as a catcher, and hit a solid .278. (His manager in Dayton was Bill Armour, who later managed Cleveland and Detroit.) In 1899 Donahue again spent the season in Dayton but was on loan to Wheeling at season’s end. It was back to Dayton in 1900 but not before Donahue and manager Armour had a contract dispute. Finally a contract was signed that included a handshake agreement. If Jiggs caught 120 games he would be paid a bonus. In August, after he had caught in 106 games with a .333 batting average, 51 extra-base hits, and 32 stolen bases, Donahue’s contract was purchased by the Pittsburgh Pirates. Armour refused to pay the bonus, though Jiggs would certainly have earned it. Pittsburgh owner Barney Dreyfuss said of Donahue, “Dayton wins the pennant and to my mind ‘Jiggs’ deserves a great portion of the credit for the victory.”3 Donahue made his major-league debut on September 10, 1900, not behind the plate, but in right field, replacing the injured Honus Wagner. He got into two more games the remainder of the season, with 10 at-bats. Jiggs was back in Pittsburgh to begin 1901 but played in just two games. The Pirates demoted him to Minneapolis but instead he jumped his contract and on July 7 signed with the Milwaukee Brewers of the American League, managed by Hugh Duffy. He played in 37 games, 19 behind the plate and 13 at first base, and hit a respectable .318. After the season the franchise was transferred to St. Louis. After playing 30 games in 1902 (.236 batting average), Jiggs was shipped to Milwaukee, now a member of the American Association. He spent the remainder of the season and all of 1903 there. After the season Donahue stayed in Milwaukee and took a job as a fireman for the Northwestern Railroad Company. (He held the job the following winter as well.) The big reason for his interest in Milwaukee was Alice Jane Harwick, a Syracuse, New York, native whose family had moved to Wisconsin. They were married on August 30, 1905. When Donahue arrived in Chicago, veteran Frank Isbell was entrenched at first base. It took only a few weeks for Jiggs to claim the position with his glove work, with Isbell being exiled to second base and the outfield. Donahue played in 102 games. His batting average was .248 with 17 of his 91 hits for extra bases. But it was his defense that kept him in the lineup. The second year in Chicago added to Donahue’s reputation as the best defensive first baseman in the game. He led American League first basemen in fielding percentage (.988), putouts (1,645), assists (114), and double plays turned (77). He batted.287, his major-league best. Jiggs and Alice spent the 1905-06 offseason in Chicago. For Chicago baseball fans, 1906 was a magical year. Donahue was late for spring training in New Orleans after a short contract holdout. As the team barnstormed north, it stopped for a two-game series in his hometown with the local Springfield Babes. The visit marked the opening of the city’s new baseball stadium. Jiggs got to play against his youngest brother, Frank, the Babes’ second baseman. After the first game of the series, city officials presented Jiggs with an engraved watch said to be valued at $50. He was moved to tears. Donahue also led on the field, offensively and defensively, as the White Sox took the Cubs in six games. He batted .333 and recorded the only hit against the Cubs’ Ed Reulbach in Game Two. But again, it was his defense that stood out most. Donahue again showed in 1906 why he was considered the best first sacker in baseball. He led American League first basemen in fielding percentage (.988), putouts (1,697), assists (118), and range factor (11.79, a retroactive statistic compiled many years later). The world champions were in demand and Jiggs took charge, serving as player-manager of their barnstorming team that fall. He received an offer to have the team hit the theatrical circuit but many of the players had already left for their winter homes. If he could have organized them, they would have made $1,000 a week each for eight weeks. Jiggs had gained a reputation as a freewheeling, fun-loving teammate who enjoyed regular nights on the town. Night life in Chicago fit his style. He liked fast cars, and also developed proficiency at bowling. However, maybe this lifestyle helped lead to an unfortunate beginning to 1907. Donahue was seriously injured in an auto accident in February, suffering severe facial lacerations when he hit the windshield. Jiggs recovered and enjoyed a good year on the field in 1907, but the White Sox failed to repeat, finishing third as the Detroit Tigers won the pennant. He batted .259, but it was on defense where he entered the record books. He led the league in the same categories as the previous year, and set a record for putouts (1,846, or 12.65 per nine innings) that still stood in 2015. He set records with 21 putouts in a game and 140 assists for the season that have since been surpassed. In his 2008 book Baseball Ratings, The All-Time Best Players at Each Position, 1876 to the Present, author Charles Faber rated Donahue the best defensive first baseman of all time. 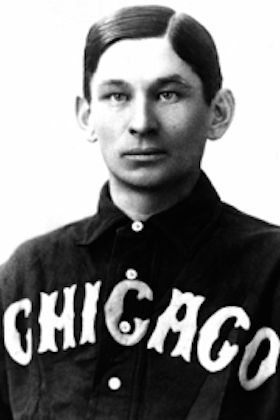 Donahue’s last full season with the White Sox was 1908. His defense was still top-notch, but he lost his hitting stroke, batting only .204. Though he had led the American League in games played (157) and at-bats (609) in 1907, his games played were reduced to 97 in 1908 and his at-bats (304) were cut in half. His poor season could be attributed to several factors. Jiggs sustained an injury in Washington early in the season; he had become distracted by outside interests (he had purchased the Drexel, a Chicago Southside bowling resort); his love of nightlife led to speculation that he had contracted the venereal disease that would end his life prematurely. That season Jiggs’s brother Pat made his major-league debut, as a catcher with the Boston Red Sox. Jiggs led another barnstorming tour, this time to play in northern Illinois and southern Wisconsin. In order to regain his vitality, Jiggs and Alice traveled to Hot Springs, Arkansas, before spring training in 1909. It later became their retirement home and they became active members of the community, Alice especially.8 But for Jiggs the hot springs did not prove the elixir. The 1909 season began just as the 1908 season had ended except that not only had Donahue’s hitting skills eroded but he had also slowed in the field. On May 16, having played in only two games, he was part of a trade to Washington, where he spent his last five months in the big leagues. The White Sox sent Donahue, Nick Altrock and Gavvy Cravath to the Senators for Sleepy Bill Burns, who would become part of the Black Sox Scandal in 1919. The Dayton Veterans of the Central League tried to deal with Minneapolis for Donahue’s release so he could become their manager, but a deal could not be reached.10 Jiggs remained in Chicago in 1910 to look after his bowling alley and try to regain his baseball form. He purchased a Chicago League team but did not play. His plan was to try to come back in 1911. Donahue spent the winter back in Hot Springs, where he bought a bowling alley and athletic resort. “I have given up the game insofar as playing the game is concerned, but if I find a franchise in the minors anywhere loose I may take it up,” he said.11 He brought some of his old friends to town and put together a series of games in February between National and American League stars. Even though Donahue said his playing career was finished, he did try one more time, with the White Sox. But in a spring-training tryout it was obvious that his skills had continued to diminish and the White Sox did not sign him. Still very popular in the baseball community and not quite ready to give up the game, Donahue headed to Texas and the Class D Texas-Oklahoma League to manage the Cleburne Railroaders in 1911. After modest success with a team lacking in talent, he was hired in midseason to manage the Galveston Sand Crabs of the Class B Texas League. He did play in his last 14 games. His batting average was .136. Ten months later he would be dead. Donahue was quickly declining, the effects of syphilis beginning to ravage his mind and body. It was speculated that his time was shortened by his failed tryout with the White Sox and a deteriorating relationship with Alice. It was difficult to maintain her Hot Springs social standing with a husband suffering from a socially embarrassing disease, not to mention the prospect of his loss of income. On December 23, 1912, Alice received a decree of divorce in Hot Springs and was given the family assets. She moved back to Milwaukee. Two weeks before Donahue’s actual passing, his death was reported in many newspapers around the country. After further investigation it was determined that he was still alive, but Alice was trying to collect his life insurance a little early. On July 19, 1913, Jiggs Donahue died. He had just turned 34 years old. It was front-page news in Springfield, including the Grantland Rice poem above. Ed Walsh and William Sullivan (Jiggs’s White Sox roommate) represented the White Sox at his funeral. (Although their train arrived too late for the Funeral Mass, they were in time for the graveside service.) Charles Comiskey sent an arrangement of roses.15 Donahue, considered by many baseball’s greatest defensive first baseman, was laid to rest in Springfield’s Calvary Cemetery in an unmarked grave. Faber, Charles F. Baseball Ratings: The All-Time Best Players at Each Position, 1876 to the Present, Third Edition (Jefferson, North Carolina: McFarland and Company Publishers, 2008). Milwaukee Journal, June 17, 1907. 1 Springfield (Ohio) Daily News, July 19, 1913: 5. 3 Sporting Life, October 6, 1900: 2. 4 Minneapolis Journal February 4, 1904: 6. 5 Sporting Life, November 3, 1906: 5. 7 Pittsburgh Press, March 19, 1908: 8. 8 Sporting Life, January 13, 1912: 6. 9 Spokane Press, February 17, 1910: 17. 10 Bismarck (North Dakota) Daily Tribune, November 14, 1909: 6. 11 Sporting Life, September 17, 1910: 2. 12 Springfield Daily News, July 19, 1912: 1. 13 Springfield Daily News, July 23, 1912: 1. 14 Pittsburgh Post Gazette, August 3 1912: 9. 15 Springfield Daily News, July 23, 1912: 1.